Life at Uni: Will the world end if I fail my exams? The short answer, in case you were in any doubt, is “No”. The world won’t end if you fail your exams. At one level, you already knew that. The planet won’t be destroyed if you don’t get the exam grades you wanted. However, there’s another version of the question that bothers a lot of students. It’s about whether their personal world is going to be destroyed by exam results. Again, the answer is “No”. This article is about the reasons for that answer. It’s another gentle, supportive article with practical advice. To set the mood, here’s a picture of a sweet little kitten. First, some practical administration: As usual, I’m writing this with my personal hat on, not in my capacity as a Keele member of staff. With that clarified, I’ll return to the topic of this article. So, there you are, facing exam results in a state of dread. 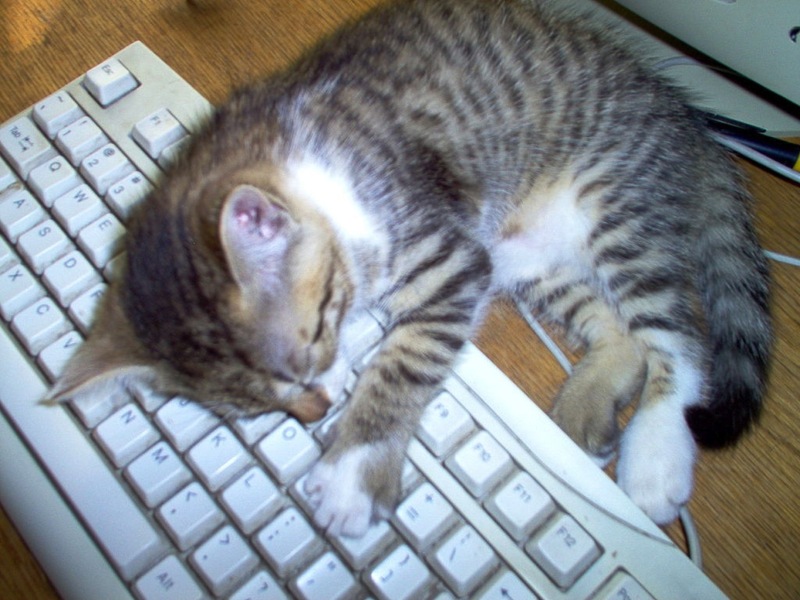 You may have worked yourself to exhaustion, and fallen asleep at the keyboard like the kitten in the picture above, or you may have not worked anywhere near as hard as you think you ought to have worked, or you may have worked sensible hours and still have that feeling of anxiety and fear. You may be trying to ignore that official-looking letter or email with the exam results, or you may be thinking about the looming exams. It’s not a great feeling. It’s a good idea to use both nuts and bolts solutions and chicken soup solutions in combination, so that you are improving the situation while also improving how you feel. Nuts and bolts solutions are about practical steps. They might feel a bit impersonal sometimes, but they improve the situation that you’re in. Here are some examples. I’ve started with things that will give the most immediate help, and moved from there towards longer-term solutions. Contact the student support services. The staff in student support are usually wise and knowledgeable, and can tell you about practical solutions that you might never have heard of, or never have thought of. Talk to your tutor. If you don’t want to talk to your tutor for whatever reason, then try a wise, approachable member of staff. They’ll know a lot about options available within your chosen field (for instance, career routes that don’t depend on having a particular class of degree). Find the support service for exam nerves and anxiety, and sign up. Decide in advance which treats you will reward yourself with after you find the support and after you sign up, and line those treats up in advance so that you get good, positive reinforcement for taking those first steps. Learn about exam technique. Sometimes a few simple concepts can make a big difference. This is a particularly good idea if you can’t see why you’re not getting better marks; maybe there’s some simple thing that nobody’s ever explained to you. Student support services and/or a friendly member of staff can point you towards your university’s support in this area. Have a Plan B. It’s a good idea in life always to have an alternative plan, preferably a plan that you can enjoy, as opposed to a dismal “better than nothing” plan. This means that you don’t end up with all-or-nothing gambles at key points in your life; instead, you have branch points where both routes are good. That’s a much better situation to be in. Gather information. Usually there are answers to your questions if you find the right places to look. The student support services and friendly members of staff can usually tell you some good places to start looking. The information may be about exam stress, or exam technique, or about what you can do with your life, or a combination of all of those. I’ll return to this issue later in this article. Chicken soup solutions are about how you’re feeling, and about ways of helping you emotionally. They might not always fix the underlying problem, but they do help you to feel better. Here are some examples. Talk to student support services. They’re usually good at helping you get emotional support, as well as practical support. Academic staff will usually encourage you in this direction, so that you can get support from people with training and experience in the specialist area of emotional support. Set yourself small, manageable goals, with a treat after each goal. This both helps you to feel more in control, and gets you moving again. At the start, “small” can be very small; it might be “getting a small box of chocolates that I can use as rewards”. Take it at a pace that you can manage. Try the BANJO approach. This works for a lot of people, and it’s well worth a try. It stands for Bang Another Nasty Job Out. It involves doing something unpleasant as your first job of the day, or the afternoon, or whatever time works for you. After that, you don’t set yourself any particularly unpleasant tasks for the rest of the day, as a reward for having done the one you weren’t looking forward to. Remember to choose a job that has a clear end point, so that the rest of your day will be okay. Have a plan. When you have a plan, temporary obstacles are less intimidating. It doesn’t need to be a great plan, or a plan of what you’ll do for the rest of your life. It might be as simple as “I’m going to find a reasonably well paid job that involves working outdoors some of the time, and making the world a better place”. That plan doesn’t depend on passing any exams; there are lots of routes to that destination which aren’t affected by exam results. As always, having a Plan B is a useful part of this strategy. Find and read supportive material. There’s plenty of it around; for instance, books like Feel the fear and do it anyway are excellent both for support and for inspiration. Returning to the starting point of this article: Your exam results won’t destroy your personal world. You’ll still have your friends and your family and your health and everything else. Your exam results can affect your personal plans, but that’s very different from destroying your personal world. What’s scary about having your plans affected is not knowing what other possibilities are open to you. It’s like the way that horror movies don’t show you the monster in the cupboard, and let your imagination work overtime coming up with all sorts of shapeless dread. The reason they do this is that the reality is nowhere near as scary as what you’re imagining; it’s just someone in a rubber suit, or a segment of computer generated imagery. It’s the same with life plans. If you re-think the original question as “How will my plans be affected if I fail my exams?” then it’s a lot less threatening, and you can start tackling it more effectively. Here’s an example. All of these are perfectly feasible, and all of them offer some advantages over the direct 2:I route. There are a lot of really interesting jobs and careers that most people have never heard of; a few hours spent finding out about them could be the best investment of time that you ever make. Working your way up within a career can give you a lot more knowledge and credibility than entering higher up, and can display initiative and commitment when you apply for promotion or other jobs. A lot of MSc courses will accept applicants with a 2:II; getting an MSc might let you apply for the job you originally wanted, and will make you eligible for jobs that weren’t feasible for you previously. If you fail your exams completely, you probably won’t feel good about it, but again, it’s not the end of your personal world. There are plenty of inspiring, amazing things you can do with your life that don’t need a qualification. The work that I’ve most enjoyed on a day to day level was my time on excavations in archaeology, which didn’t need any qualifications at all. So, in summary, the main underlying issue is the unknown. Once you start gathering information and making even the most sketchy of plans, everything starts feeling better. Also, the combination of more information and feeling better can create a virtuous cycle, by improving your prospects of getting the results that you wanted in the first place. 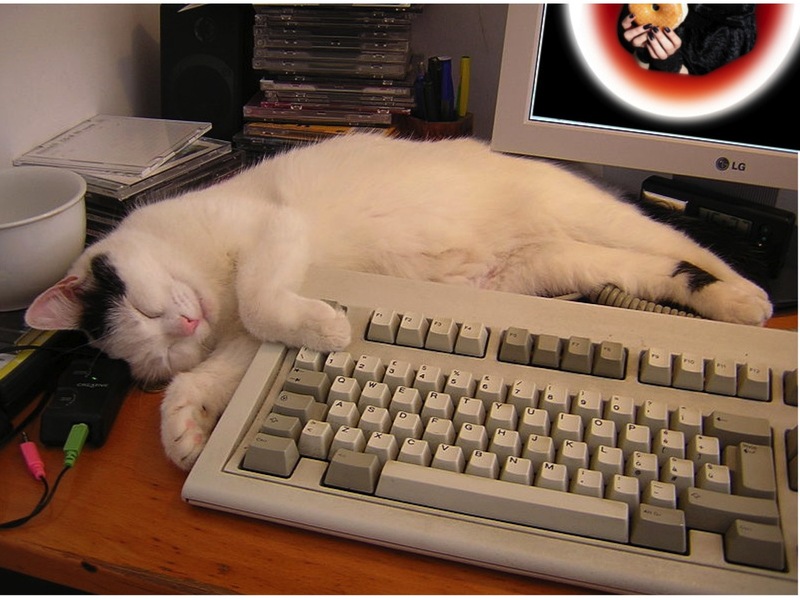 I’ll end with another image of a cat sleeping at a keyboard; this time, it’s a cat that’s chosen to sleep beside the keyboard, rather than a cat that’s fallen asleep at the keyboard. It’s an image that has a whole world of positive sub-texts. I hope that it brightens your life, and that it helps you move forward with gentle, happy thoughts. There are a lot of other articles on this site about academic life and education, including topics that students often have trouble with, such as the differences between academic writing and other types of writing. They’re tagged under “education” and/or “craft skills”. You can find others by searching within the site for words like “writing”. We hope you’ll find them useful; if you’d like to see more on some particular topic, let us know via the comments section, and we’ll see what we can do. This entry was posted in hints and tips, useful concepts and tagged career choice, exam results, failing exams, life planning by hydeandrugg. Bookmark the permalink.